The Connections tab is where you define the connections to your data sources. 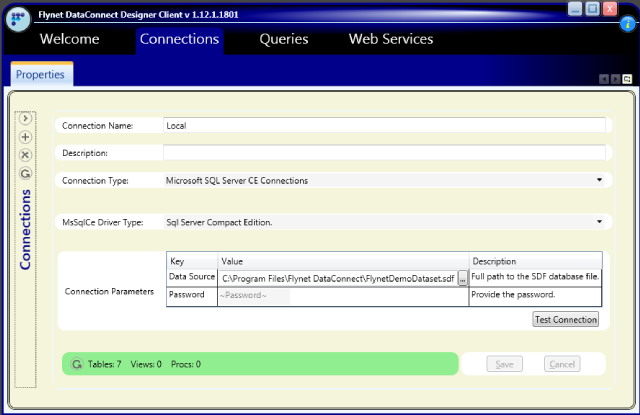 Connections are made using a provider for .NET, OLEDB or ODBC. We recommend for the best experience to use the provider for .NET where it is available. You create a new connection by pressing the (+) icon at the left hand side. You need to give your connection a name, and optionally a description. Then you have to select one of our native connectors, or choose to connect via OLEDB or ODBC. We recommend you use a native connector where available. Once you have selected your connection, you are prompted for various values that are needed to make a succesful connection to your data source. You press the [Test] button to see if the details you have provided are correct. Once the test passes, you are able to press the [Save] button to save your definition. You can come back at any time and update any of these settings. You can press the [Test] button to make sure you changes are correct, and then you press [Save] to store your changes.